We offer a wide variety of rooms from short to long-term rentals. We take care of each of the rooms ourselves to ensure that you receive the highest quality from each room. How about staying at one of our comdominiums that are economically more feasible and which offer a slightly different lifestyle from your usual stay at a hotel and that may offer a lifestyle that is closer to island living? You might even discover something brand new. Please feel free to contact us with any questions or comments you may have regarding condominiums or property management in Hawaii. 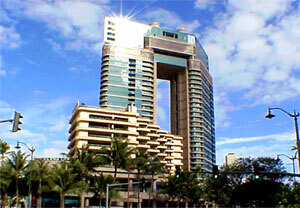 Our office is on the 3rd Floor of the Waikiki Landmark. Welcome to Oahu, where vacation dreams do become a reality. The lush island terrain, glittering waters of the pacific, and beach resort destinations bring countless visitors and residents to Oahu every year. Hawaiian Dream Vacations offers exciting locations that you’ll love to return to year after year. From our residential condominiums and hotel condos such as Hawaiki Tower, Nauru Tower, Allure Waikiki, Waikiki Landmark, Waikiki Banyan, Waikiki Sunset, Waikiki Beach Tower, Pacific Monarch and many others you’ll be free to discover Honolulu, and Waikiki Beach and its beautiful sunsets and romantic nightlife, proven to be some of the most popular in the world. You’ll enjoy easy access to Hawaii’s unforgettable white sand beaches, shopping and restaurants, usually within walking distance, and you are practically guaranteed to save money by utilizing the kitchen facilities in your apartment when you choose to eat in. Our vacation rental units, located in and around Waikiki, Kaka ‘ako and the Ala Moana Shopping Center area, offer the lifestyle of a single-family home, but access to all of the sophisticated amenities of this renowned world class vacation destination. We provide a wide range of room sizes and rental rates for short term and long term vacation stays by utilizing our studio, one, two and three bedroom apartments. Reservations are accepted online or by phone, fax, e-mail, or walk-in. You can quickly find up to date room information and availability by utilizing the search function of this website. Our properties feature a straight from the airport to the apartment advance check-in. There’s no need to go to a front desk for check-in or checkout. No waiting till the afternoon to check-in and no rushed 11:00 AM checkout! You’re here to relax!